End of session wrap-up & Telephone Town Hall! The 2018 legislative session ended last Thursday, March 8th. In this short 60-day session, we were pleased to end on time and to have tackled many significant pieces of legislation such as net neutrality, property tax relief, education funding, voting rights and equal pay policies. We also passed three supplemental budgets: Transportation, Operating and Capital (construction/infrastructure). This newsletter is the first of two end-of-session updates I am sending out this week. This session update covers legislation that supports our youth, equal rights for women and workers, and prevention of climate change. Part 2, later this week, will cover the supplemental state budgets and legislative efforts regarding property taxes, housing and healthcare. Student rally for gun law reform, March 6, 2018. Last week, students across Washington spoke out on gun violence. They want to feel safe at school and to be heard. Our high school students are our future leaders. They need our support to keep their world safe, their voices heard and their future secure. 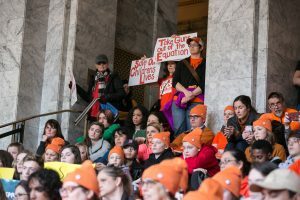 As a mom, legislator and community leader, I am inspired by the efforts of our young people to stand up for meaningful change and dialogue, and will work hard to represent their concerns in Olympia. Although there is no doubt we need to continue our work on gun legislation – such as SB 6620 to implement enhanced background checks and increase the age to 21 for buying semi-automatic rifles – we took small, but significant steps this session to protect our communities from gun violence. We passed SB 5992, which bans the manufacture and sale of bump-fire stocks, the trigger modifications that allow a semi-automatic firearm to replicate a fully automatic one. SB 5553 authorizes a person to voluntarily waive their firearm rights. This would reduce the risk of harm for people in crisis who are struggling with suicidal thoughts. HB 2519 concerns concealed pistol license (CPL) returns from law enforcement, to ensure that only those who are legally eligible for a CPL will get them. SB 6298 makes it unlawful for a person to possess a firearm if they have been convicted or found not guilty by reason of insanity of the crime of harassment when committed against a family or household member. Seeing our teenage youth finding their political voices was a big step forward in this debate. We also took significant steps to make voting easier for young people and eligible voters. We passed automatic voter registration that will occur when eligible voters interact with government agencies, such as when they apply for an enhanced driver’s license. 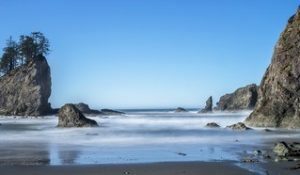 When Oregon recently enacted automatic voter registration, they added nearly 300,000 new voters in just one year. Motor voter preregistration for 16 and 17-year-olds allows our youngest potential voters to pre-register when they get their driving permit or license. When they turn 18, their ballot would automatically start showing up in the mail. We passed legislation (SB 5722) that protects minors from the harmful and discredited practice of conversion therapy. 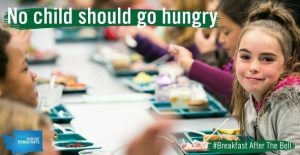 In addition, the Hunger-Free Students’ Bill of Rights bans lunch shaming of low-income students and requires schools to provide healthy, balanced meals to students, regardless of their ability to pay. We also passed HB 1508, which will expand programs that provide students from low-income families with a nutritious breakfast in the morning. Kids do not learn effectively if they are hungry. By providing kids with breakfast, we are ensuring they can focus on learning. SB 6029, known as the Student Loan Bill of Rights, protects student loan borrowers from harmful and predatory business practices and creates an advocacy office that looks out for student borrowers. 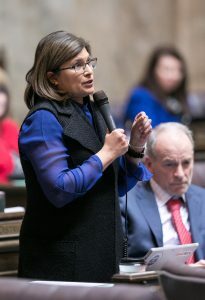 I was proud to sponsor HB 1630, which allows minors to consent to share their personally identifying information in the Washington homeless client management information system. This bill allows homeless youth to be ‘seen’ and can provide important information as to what interventions are working. 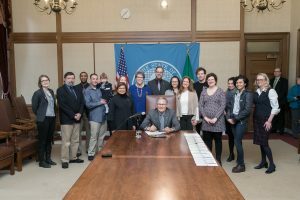 I am proud to say it passed the House and Senate, and was signed into law by Governor Inslee on March 9th. It will go into effect in 90 days. We sought to address the challenges faced by women in society and with regard to economic security. Women contribute economically to their families and to the community and deserve equity in the workplace. At the beginning of the session, we passed HB 1434, which allows state employees to share their accrued leave with colleagues who are welcoming a new baby. This builds on the good work of paid family and medical leave, which we passed last year. We also passed the Equal Pay Opportunity Act, HB 1506 that will ban pay secrecy policies, allow discussion of wages, and prohibit retaliation against workers for discussing their pay, or for asking for equal pay and career advancement opportunities. 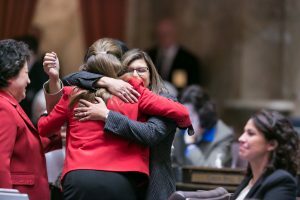 Finally, we passed bills, protecting victims of domestic violence and harassment. HB 2661 prohibits businesses from firing or otherwise discriminating against employees because they are a domestic violence or sexual assault victim. The bill also requires that employers provide reasonable accommodations for safety if requested by an employee. We were not able to achieve significant climate legislation this session. However, I look forward to the continuing work on this. A solid number of bills were introduced, and lawmakers are engaging in significant ways on both sides of the aisle to work toward better solutions to climate change. The House passed HB 1144, legislation that sets emissions reduction targets for greenhouse gases in 2020, 2035, and 2050 and strengthens these targets based on the latest climate science. Unfortunately, it stalled in the Senate. HB 1144 also incorporated language from my bill HB 2294 that aligns our state’s emission goals with the Paris climate agreement. HB 2295, my bill regarding hybrid-electric or electric aircraft and rural economic development bill call the Link Air Act also stalled in the Senate. However, we were able to get some funding for a working group that will look to make Washington an innovator in this new industry, help mitigate impacts of air transportation on climate change, and rejuvenate our rural economies. Over the course of this busy session, I had 195 meetings with stakeholders, met with 66 constituent groups, and received over 700 constituent emails. Thank you for all your feedback. 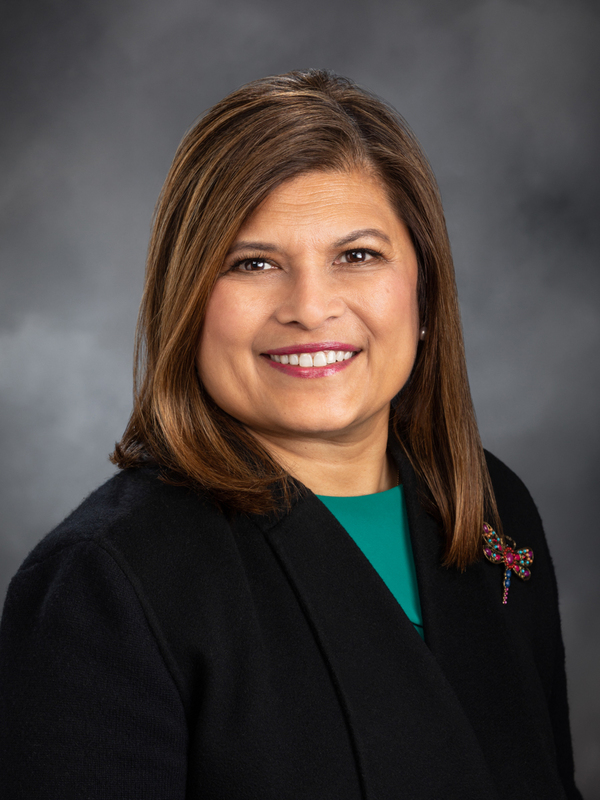 If you have questions on any of the above information, concerns, or requests, please join us at the telephone town hall this week, or as always, reach out to me at vandana.slatter@leg.wa.gov. You can also contact my district office in Bellevue at 1611 116th Ave NE, Suite 206, or by phone at (425) 453-6424.